Paul started his career in youth football with Redheugh Boys Club, a youth team based in Gateshead before eventually breaking into professional football with Hartlepool United in 1991. 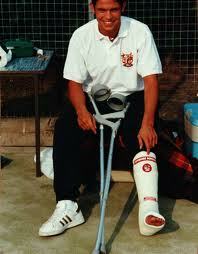 Paul stayed with the ‘monkey hangers’ for 4 years before eventually leaving the club in 1995. Paul’s time at Hartlepool was “a bit stop-start with ongoing shin splint problems” which hampered his career there and limited his chances to 56 first team appearances in which he scored 9 goals. Reflecting on his time in County Durham, Paul took some solace in the fact that he “managed to play in some big cup games, most notably against Arsenal at Highbury in the League Cup”. The game Paul is referring to took place in the 1994/1995 season in the Coca Cola League Cup 2nd round 2nd leg. The Gunners won the game 2-0 with Kevin Campbell and Paul Dickov the goal scorers for the North London side. Paul remembers the game fondly saying that that Arsenal team was the best team he played against in his career by “a mile” and ruefully adding “playing against Tony Adams and Martin Keown showed me what proper defending was all about!” For the record the Gunners won 7-0 on aggregate over the two legs. 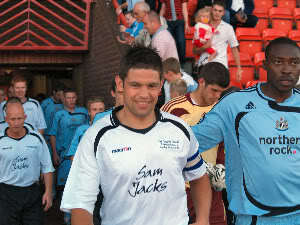 Paul decided in 1995 to drop into non- league and back to his roots by joining Gateshead FC for his first spell with the club. It was a fruitful time for Paul as he found the back of the net 23 times in 80 appearances until a certain North Hertfordshire club came knocking for his services at the end on 1996/1997 season. Paul’s career at Boro started disastrously, picking up a bad injury sustained in a pre-season game against Cambridge United. In front of the home fans, Paul opened his account for Boro with a spectacular effort “which was voted goal of the season as well. A great team effort and definitely my favourite” before he sustained a broken leg which would prevent him for kicking a football in anger for a further 7 months. Roomed with Stayed in a club house with Errol Telemaque. 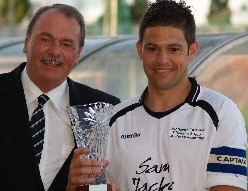 Paul had a brief spell at Kettering Town before returning to Gateshead FC in 1999, a spell that lasted to 2004 where he played another 170 games with a 48 goal return. Spells with Bishop Auckland, Blyth Spartans & Whitley Bay followed before another return to Gateshead where he completed another 100 games between 2005 and 2008 netting a further 17 goals. Stevenage FC History website would like to thank Paul for agreeing to the interview and for all the help given in compiling the article. We would also like to wish Paul all the very best for the future. All images supplied by Paul Thompson and reproduced with his kind permission.